Threadleaf phacelia or Phacelia linearis is a native plant with delicate white and lavender-to-violet bell flowers and thick, narrow leaves. 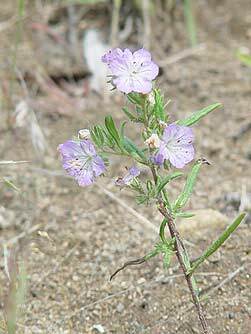 This annual wildflower, known as Phacelia linearis, is nicely adapted to survive hot, dry conditions, favors sandy or gravelly open spaces in the shrub-steppe and pine woods, and blooms in mid-spring to early summer. Threadleaf phacelia flowers support spring-foraging bees and beneficial wasps, including sensitive masarine wasps that rely solely on Phacelia pollen as food for their offspring. 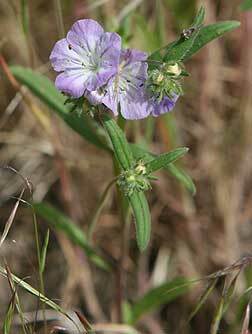 This Phacelia is distributed from British Columbia to California and east to Utah and Montana. Threadleaf phacelia begins blooming with silverleaf phacelia and (in Washington state) with silky lupine and blanket flower and alongside late-summer blooming snow buckwheat. 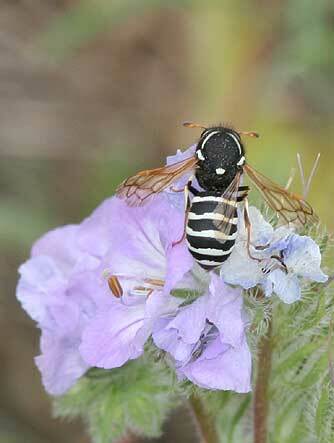 Some species of Phacelia are planted as ornamentals, and in some countries are cultivated as crops to produce honey. Seeds of several Phacelia species require light to germinate, and a period of incubation below 60 degrees F per Young and Young's Collecting, Processing and Germinating Seeds of Wildland Plants .